December 6, 2012. Washington – The “p” in “pTA” emphasizes that the people who fund technology development (through taxes and consumer purchases), and who live with its positive and negative consequences, but are not otherwise formally engaged through advocacy, can and should play a role in technology assessment (TA). While some advocates for TA called for the inclusion of participatory practices from the beginnings of the field’s evolution in the United States, action to implement this idea did not begin until the late 1980s, largely in Europe. In society at large, however, participatory practices have expanded considerably over the past two decades in relation to science and technology in particular, and social decision-making in general. Seeing the need for pTA and some recognition of its value in an environment where prospects for major initiatives are remote, five organizations (the Museum of Science, Boston, the Consortium for Science, Policy and Outcomes of Arizona State University, the Loka Institute, Science Cheerleader, and the Science and Technology Innovation Program at the Woodrow Wilson International Center for Scholars) formed the Expert and Citizen Assessment of Science and Technology (ECAST) network in 2010. ECAST was officially launched at the Woodrow Wilson Center for International Scholars on April 28, 2010, where Loka Institute founder Richard Sclove presented his report Reinventing Technology Assessment: A 21st Century Model. The network’s first large scale project was coordinating the U.S. component of World Wide Views on Biodiversity, a global citizen consultation held in 25 countries on September 15, 2012 that provided input to the Eleventh Council of Parties of the UN Convention on Biological Diversity held the following month. 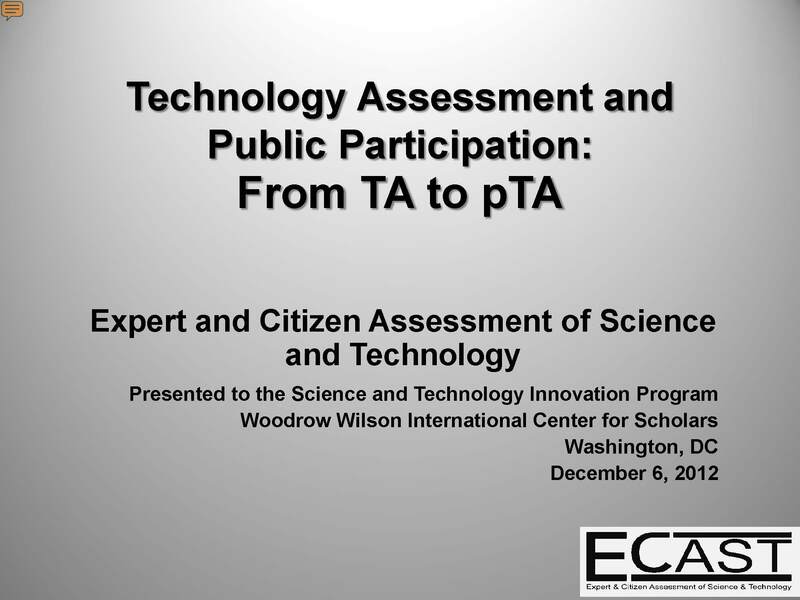 Report from that project, Technology Assessment and Public Participation: From TA to pTA will be released at a special briefing event on Dec. 6, 2012 in the fifth floor conference room at the Woodrow Wilson International Center for Scholars, Washington, DC. It will address the state of pTA in the U.S. with some reference to other countries, and focus in particular on WWViews as a case study to explore the strategies and capabilities of ECAST addressing the question: What role can a distributed network play in conducting and institutionalizing pTA in the U.S.? Speakers: Richard Worthington, Professor of Politics and Chair of the Program in Public Policy Analysis, Pomona College will lead the presentation supported by ECAST colleagues Darlene Cavalier (Science Cheerleader), David Sittenfeld (Museum of Science, Boston) and Gretchen Gano (Arizona State University, UMass Amherst). David Rejeski, Director, Science & Technology Innovation Program, Woodrow Wilson Center will moderate the discussions, which will include comments from Tim Persons, Chief Scientist, Government Accountability Office (GAO) and Mikko Rask, Head of Research, National Consumer Research Centre, Finland. Founded in 2010 as a response to a call to use “citizen participation, collaboration and expert analysis to inform and improve decision-making on issues involving science and technology”, ECAST is a collaboration among university, informal science education, and policy research partners to establish a non-partisan, independent, flexible, and proactive technology assessment capability in the United States. The Consortium for Science, Policy and Outcomes at Arizona State University, Loka Institute, Science Cheerleader, Museum of Science Boston, and the Science and Technology Innovation Program at the Woodrow Wilson International Center for Scholars are its founding members.